From the practical point of view, winter squash is a funny place to start this year’s food garden posts. The growing part is easy enough but the finding room part is hard. You can get a whole summer’s worth of beans and tomatoes and herbs and flowers and greens and garlic (and more), out of the amount of ground it takes to grow a modest crop of squash. But it never hurts to Know Your Food; I promised back with the squash recipe hints that the garden part would come soon and seed ordering time is galloping toward us apace. So is plant ordering time. And garden design time and all the rest of it. 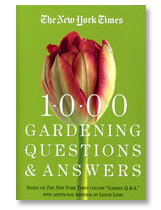 There are a few tips about coping in New Year Portfolio Analysis, Garden Division. I’m not sure why, but we’re in the midst of a great squash boom. Catalogs are crawling with scrumptious-sounding options: Pink Banana, Honey Bear, Sweet Dumpling… It’s easy to decide Long of Naples is probably too big (20 – 35 pounds) and Lady Godiva, a tasteless number grown for its “naked” seeds, probably doesn’t merit the space. But how do you decide whether to throw in your lot with, say,Galeux d’Eysines? Cucurbita pepo ( Acorn, Delicata, pumpkins, including New England Pie and Winter Luxury) The same species as summer squash, ready to eat right off the vine. The winter kinds can be really superb – Sweet Dumpling deserves its name – but they can also be bland and stringy, and good or bad they seldom keep well. 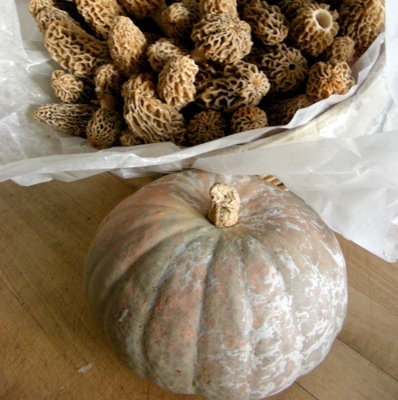 Cucurbita moschata ( Butternut, mostly, until you get to heirlooms like Musquee de Provence and Sucrine du Berry.) It keeps forever, but you may find durability its main claim to fame if your idea of good squash is sweet, dense fleshed and round flavored. Moschatas are more likely to be moist and just generally squash-tasting, sweeter than some other vegetables but nothing noteworthy in that department. There are outstanding varieties, especially among those that take a long time to grow, but moschata is not the location of the motherload. which is not an heirloom. It’s a hybrid. Developed by Rob Johnston, of Johnny’s Selected Seeds, a squash-mad genius who’s also responsible for Cha Cha, our former favorite, and several AAS winners. Confection is not high yielding, and the 3 to 5 pound fruits aren’t worth eating until they’ve been stored for at least a month. But after that they just keep getting more and more rich tasting, velvety and sweet until February or March and they’re still good when it’s finally not squash season any more. 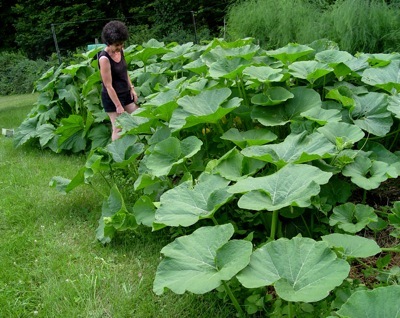 Other than hoping the species rule applies to the squash in question, we’re stuck with depending on the usual: how big is the plant? (The “bush” varieties of anything you’d want to eat are generally 6 feet or more in diameter, btw). How long until harvest? Any description that mentions regional suitability gets extra points. Growing tips follow asap after today’seek! knee surgery, and now you know why they’re not here now. The Confection squash endorsement from you means a lot to me. Thanks! We grew winter squash for the first time this year. Uncle David’s Dakota Dessert from Fedco and Hopi Red from Seeds of Change. Both are yummy but my lord, it is so much squash. I’ve made soup and lasagna and roasted it for the dogs and they just keep on giving. Uncle David’s is a buttercup and husband says it is too sweet and he has been known to eat brown sugar from the bag. We are deciding now on which variety to grow this summer. Thanks for the description of each species. That helps me a lot. Thank YOU, Rob, for creating it! RW – Thanks for the reviews. I try to resist the siren call of Southwestern varieties, figuring they won’t be happy in my Northeastern gardens, so knowing from your previous comments that you’re in upstate NY, it’s interesting to hear you did well with something that’s got “Hopi” in its name. cheerleading! Buttercups are everywhere and my general rule is “don’t plant what you can buy” (you need the space and local farmers need the business), but Uncle D. had already caught my eye ( how could it not?) and now I’m thinking…we have room for 2 varieties besides must-have Confection, so maybe. Summer 2008 was an exceptionally dry one for us. That combined with rocky soil probably helped the Hopi squash survive. Craig used to work for a seed company ( Sakata) as both a floral plant breeder and a field trials coordinator so he has a very good sense of what can and can’t perform well here. Once I announced that I will no longer try to grow peppers or eggplant, he took up the gauntlet and will trial them himself this summer in a well protected corner of the garden surrounded which is surronded by black fabric which we use for weed control. Veggie land was created in a former ( abused) corn field . The commercial black fabric while not my first choice, has made a world of difference when it comes to weed control-especially since we let the fields go wild since we love the creatures( mostly insect life) that habitat encourages to live there. Well, okay, not all of them. One rabbit in particular might think about moving down the street..
That’s quite a list! Sounds like you’re a perfect candidate for joining Seed Savers Exchange. Being a member gives you access to their Yearbook, where members offer thousands of seeds, many of which are not commercially available and I notice 3 varieties of Hopi squash being offered there. I’ve learned the hard way that anything native to the southwest is mighty chancy here in New England and the longer whatever it is takes to grow, the truer that is. Good luck with your experiment – and if you’re not in likely Hopi country I’d love to hear how your crop comes out.